According to a survey report from The National Business Group on Health, 68 percent of employers contribute a predetermined amount per participant. 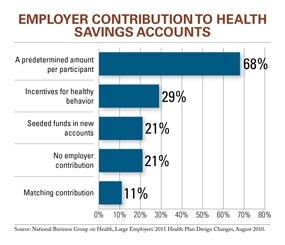 Other contribution strategies include incentives for healthy behavior (29 percent), seeding funds in new accounts (21 percent), and matching employee contributions (11 percent). Twenty-one percent of respondents reported that they did not contribute to the accounts.